What was your favorite cereal growing up? My favorites included Kix, Life, and on special occasion Lucky Charms. Like most kids, I thoroughly enjoyed eating all marshmallows immediately and leaving the boring cereal bits to sink to the bottom; forgotten and soggy. 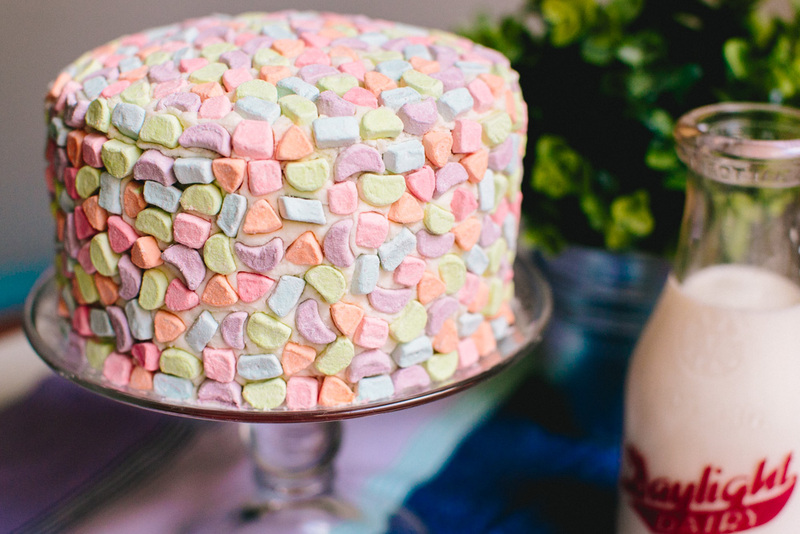 These little freeze dried pastel bits were the inspiration for this Cereal Supreme Cake. I ordered 1lb of them and I can tell you I needed waaaaaaay less than 1lb. My 6 year old self would be very proud of my current stash of cereal mallows. The marshmallow mosaic does take patience, but is very worth it in the end. 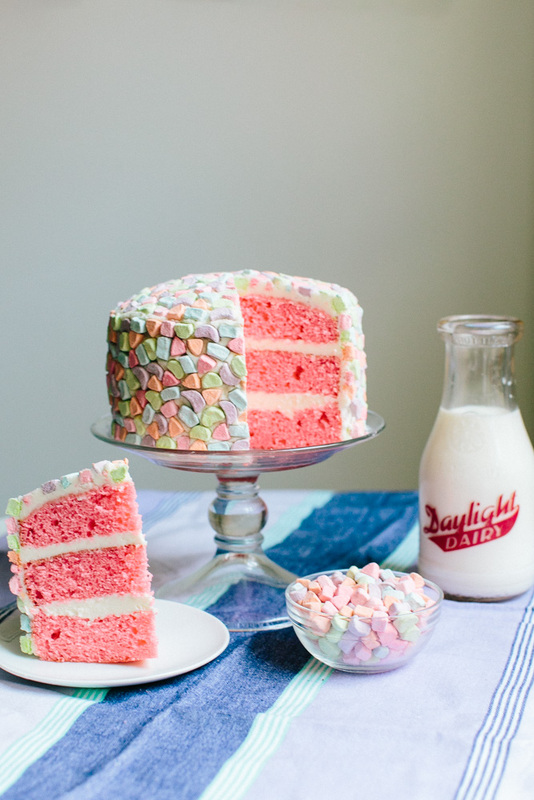 My favorite part is that a knife cuts easily through the marshmallows giving you clean slices of yummy breakfast cake. Genius pastry chef, Christina Tosi, inspired the cake flavor here. I replaced the milk in a classic vanilla cake recipe with her famous Cereal Milk made by steeping toasted cornflakes in milk to mimic the bottom-of-the-bowl sweetness. I figured a pink tone would be a cute nod to color milk turns when any "fruit" flavored cereal lingers too long in the bowl. 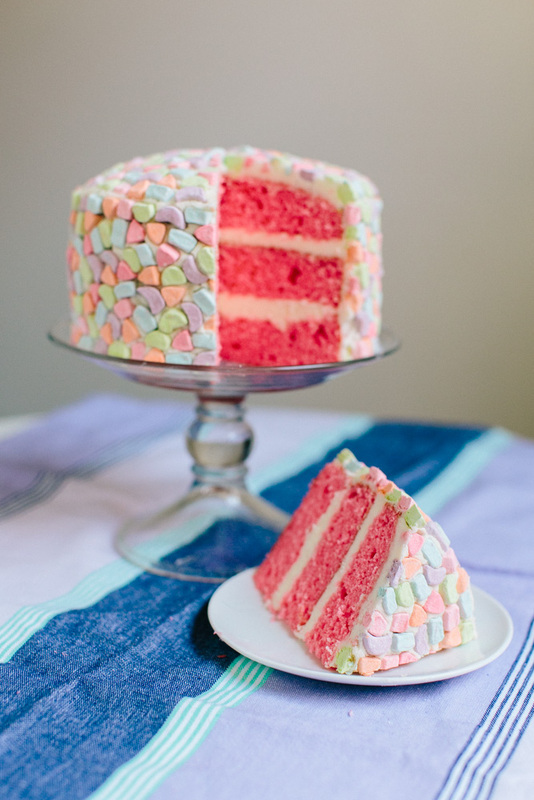 This cake may or may not be part of a healthy balanced breakfast but it sure does look nice! Spread the cornflakes on a parchment or Silpat lined sheet. Bake for 15 minutes until lightly toasted. Cool completely. Transfer the cooled cornflakes to a large pitcher. Pour the milk into the pitcher and stir vigorously. Let steep for 20 minutes at room temperature. Strain the mixture through a fine-mesh sieve, collecting the milk in a medium bowl. Using the back of a ladle or spoon, wring the milk out of the cornflakes, but do not force the mushy cornflakes through the sieve. Whisk the brown sugar and salt into the milk until fully dissolved. Preheat oven to 350 degrees. Spray three 6-inch round pans with cooking spray and line the bottoms with parchment. In another bowl, beat together butter and granulated sugar with a mixer on medium speed until combined, 1 to 2 minutes. Add eggs and beat well, scraping down sides of bowl as necessary. Reduce speed to low and gradually add flour mixture, beating until combined. Add milk, vanilla, and pink food coloring, and beat until just combined. In the bowl of a stand mixer on medium speed, beat the butter until light and fluffy.